Take a drive down Tami Trail in the Tower Hill neighborhood of Fitchburg and you can’t help but notice the well-kept lawns and mature trees that line the street. It’s clear that the owners here take pride in their homes. When you reach 2724, the first thing you notice is how naturally this house blends into its surroundings. 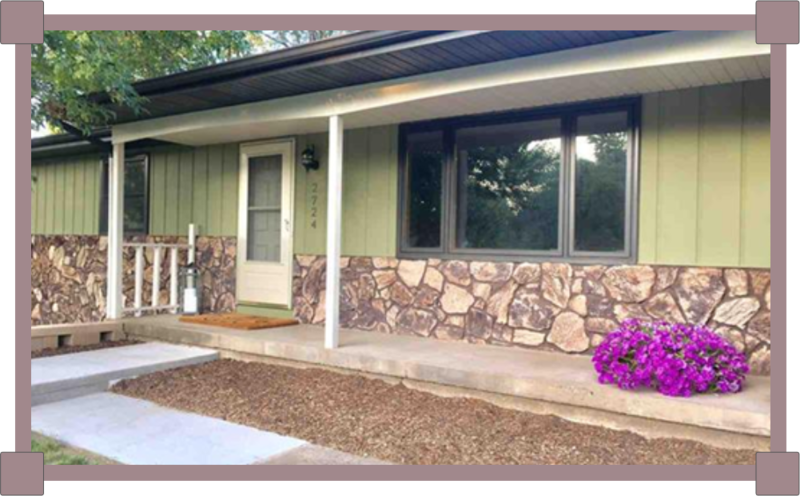 The curbside view reveals a newly painted Sherwin Williams ‘Sheraton Sage’ wood exterior accented with natural stone out front, perfectly situated on a large 1/3-acre lot. And at 2,700 square feet, this 5-bedroom 3-bath home is surprisingly spacious. The entry, freshly painted in a bright and welcoming SW Amazing Gray, is light and airy. It opens directly to a good-sized living room featuring newer large windows that let in an abundance of natural light. And a coat closet on the left of the entry is positioned perfectly for your guests — or to grab your own jacket as you head out the door. Starting in the entry, floors throughout most of the main level are a light wood-grained laminate that looks remarkably like the read deal — but easier to care for. This level also features oak trim and many newer windows throughout. A spacious kitchen is just ahead. Also freshly painted in SW Amazing Gray, its open concept is the perfect place for a family to gather. 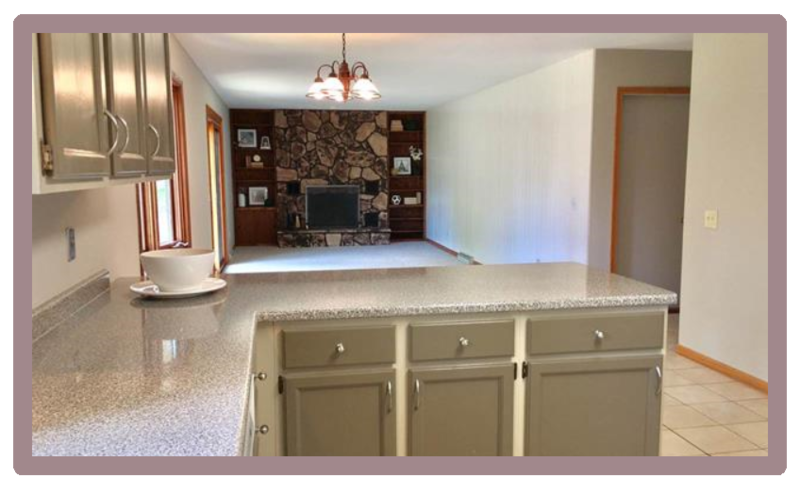 A granite-look laminate counter with breakfast bar and dinette area offer several choices for family dining, snacking, food prep or even doing homework. Painted cabinets are popular these days and the sage cabinets here are a nice contrast to the white appliances and light-colored tiled flooring. Just past the breakfast bar, a picturesque bay window and sliding doors in the dinette area look out onto a large newly redone wood deck that offers easy access to the large backyard beyond. Inside, the kitchen overlooks a family room, highlighted by a wood-burning stone fireplace surrounded by built-in shelving. What a great place to watch TV or just hang out! You’ll find 3 of the 5 bedrooms conveniently located on the 1st floor. The master is newly painted in SW Magnetic Gray, and at 15×12 sq. ft., this large room features 2 double closets with built-in shelving as well as an attached bath with shower and linen closet. Across the hall are 2 more bedrooms. Measuring 12×11 and 13×11 each, they’re the perfect size for kids or guests — especially with their large closets and a full bath right across the way. With all these amenities, this would be plenty of house for many homebuyers. But as they’re fond of saying on those late night TV commercials, “Wait! There’s more!” From the kitchen, just take the stairs down to a carpeted lower-level and you’ll see what we mean. 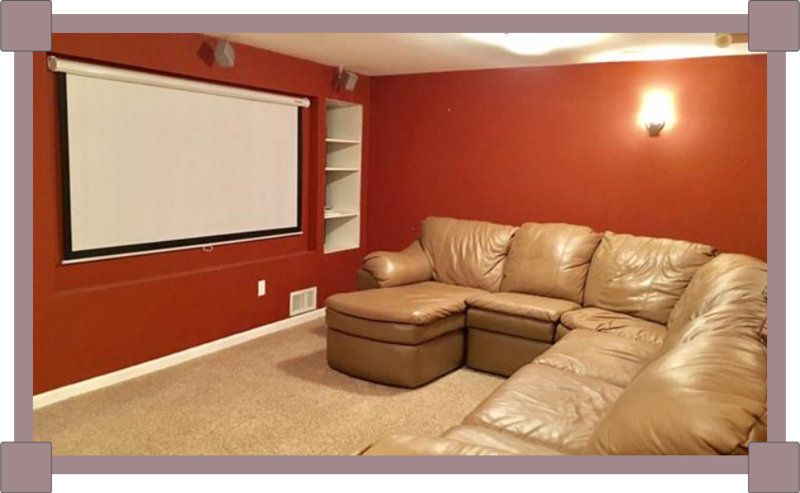 At the bottom of the stairs is a large theater room (that comes complete with the leather sectional and theater equipment). But when you don’t want that darkened-theater experience, just keep walking and you’ll find yourself in a large cheery rec room (18×15) with a wet bar and walkout to the backyard! There are 2 more bedrooms on this level — 12×12 and 12×11 sq. ft. With large egressed windows and white trim throughout, these rooms are pleasant and bright — perfect for extra guest rooms, a teen bedroom or even an office or craft room. The options are endless. And finally, there’s also a 3/4-bath, a laundry closet and huge storage/mechanical room on this level. Step outside through the sliding doors for a good look at the expansive backyard. 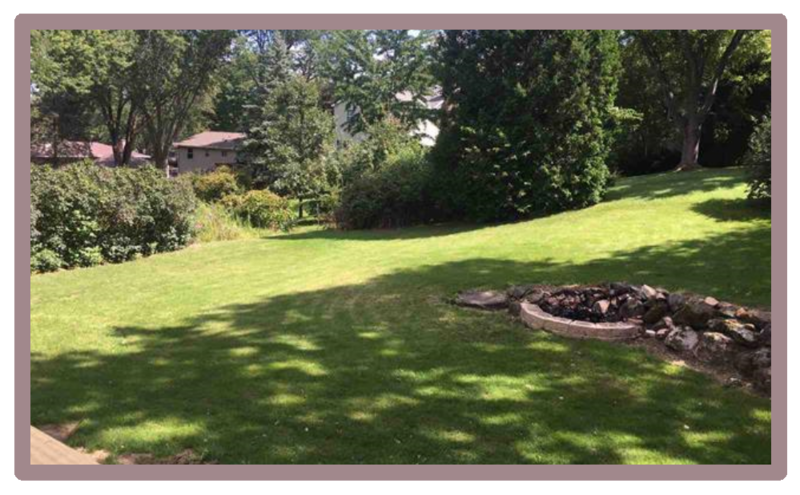 The yard is perfectly-sized, with plenty of room for kids to play and dogs to run, but still manageable when it comes to mowing! A boulder retaining wall and fire pit take center stage — and there’s even a wooden shed for extra storage. Walking around the house, you’ll find that the soffits, fascia and gutters have also been freshly painted, giving a facelift to the cream-colored vinyl siding. There’s an attached two-car garage with built-in shelving — and the extra-wide driveway extends alongside the garage, providing additional parking. Conveniently located just off South Fish Hatchery Road, you’re just a block away from Tower Hill Park. It’s also a short walk to the Fitchburg Library, the Farmer’s Market, several restaurants and area bike paths. This house combines space and charm — all in a safe established Fitchburg neighborhood.